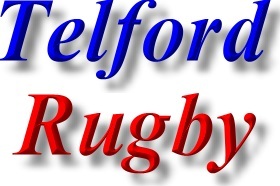 The Telford Rugby web page is provided as a free service for the people of Telford, Shropshire. All that we ask in return, is that listed Telford Rugby Teams, Telford Rugby Clubs & Telford Rugby Leagues place a link on their website back to us and hopefully mention us on their league fixtures & other paperwork. Rugby Club in Bridgnorth, Shropshire. ; Bridgnorth Rugby Club President, (07817) 101375 - More contacts within the main Bridgnorth Rugby Club Web site. Address; Hinkshay Road, Dawley, Telford, Shropshire. TF4 3NZ. ; Telephone Number; Telford (01952) 505440. Rugby Club in Oakengates, Telford. The acceptance of Telford Raiders Rugby League Club into the prestigious Rugby League Conference was a significant step for the game in the West Midlands. It was also a richly deserved reward for the many years of hard work by a few dedicated enthusiasts who have striven to give the thirteen-man code of Rugby a presence in Telford. ; Club Chairman, Mr Fred Baker (07952) 769551 - More contacts within the main site.